Responsive web designs are a system used to guarantee that a site shows up precisely on a mixture of distinct gadgets. As such, your site knows when it is being shown on a mobile phone or device (e.g. an iPhone, iPad or Android device) and consequently reverts automatically to touch friendly functionality. Why We Use Responsive Web Design in Glorious Burnley, Lancashire? The people who use your site are visiting at different times from different devices, in different locations. For example if someone visits your site whilst they are sat at a bus stop in Burnley, chances are they will need web design which is mobile friendly. It makes sense that you can guarantee that your site looks its best and works perfectly, whilst being shown on all types of device, be it a PC, tablet or the latest smart phone. Google recently produced a report on the basic pattern of “multi-screen purchasing” and the significance of your site being viewed effectively on all screen sizes. The main outcome was that Google will rank you higher! Google realises that near to 50% of the people who use their site are on mobile devices and mainly smart phones. It makes sense that these users would be hoping to see websites that are mobile friendly when trying to navigate the website. Thus it is to Google’s greatest advantage to downgrade ineffective an non-responsive websites and promote those which are easy to use. Is my WordPress site responsive? How do I tell? Straightforward, load it up on any smart phone or tablet device. Does it look simply like it does on a computer, but all squashed down and difficult to navigate? If this is the case then your site is not responsive, nor is it mobile friendly. However, if your site is showing up differently than the desktop form and is anything but difficult to explore on any type of touch screen, you have yourself a fully responsive site! Another test is to use Chrome or Firefox and dragging the window to see if the website changes. When you resize the screen down to the width of a smart phone or tablet you ought to see your responsive site change over into the new responsive layout immediatley. Give it a go on this site and see for yourself. Let Down By Your Website Company? 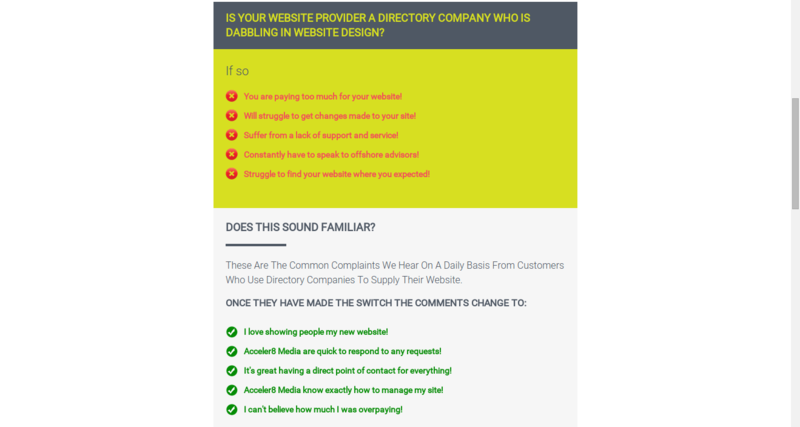 For every customer we speak to who is happy with the provider of their website, there is always another who is keen to recount their tales of woe. It never ceases to amaze me how many times we come across shockingly bad websites, produced by the same local businesses, still churning them out, week after week. Since day one at Acceler8 Media Web Design we have always maintained the quality of the work we produce and vowed never to resort to the levels of churn which litters the internet. We understand that small businesses and tradesmen have budget constraints and we are more than capable of offering competitive solutions in this marketplace. However, just because your budget is limited doesn’t mean you have to have a poor website. Probably the main offenders for producing over priced and inferior quality work are directory companies. They have a large customer base which has been built up on the back of their now dying main product. In an attempt to try and revert the terminal decline of their businesses they are reliant on their salesforce to push these products onto their customers as an alternative to print. Unfortunately, all of their sites tend to b e developed in Asia, using templated designs and badly written, generic content. In 2015 and beyond the first port of call for the majority of new or potential customers is your website. This is your shop window and the opportunity to showcase your skills and level of workmanship. If the user doesn’t like what they see, they will go straight back onto Google and look for one of your competitors. The one bonus of having a website with a directory company is that there is very little possibility of it being found via Google and portraying your business in a poor light. I’m hoping that you preferred Lancashire Landscaping, which has far more functionality and is aesthetically far superior? If so, you would probably be very surprised to know that it was actually £120 cheaper to build than the competitor site, with a management fee of half the price.